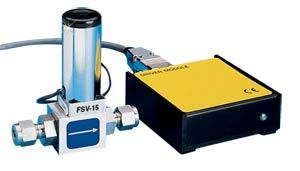 The FSV10 Series electronic proportioning solenoid valves can control the flow of a wide variety of gases and liquids. The variablestroke electromagnetic valve is pulsed by the driver electronics, maintaining the correct magnetic flux level in the solenoid and holding flow at the level of the analog input setpoint signal. A TTL-level input allows the valve to be shut off regardless of analog setpoint signal. The output power level of the driver electronics is jumper selectable for cooler, more efficient operation. The FSV10 Series requires 12 to 30 Vdc, supplied by the optional FSV-PW 110 Vac plug-in power supply or via the 9-pin D connector (included). These valves come with 8 inches of wire, which must be soldered to the 9-pin D connector. 注: Comes complete with operator’s manual, driver module and 9-pin D connector. *Based on 10 psig (690 mbar) differential pressure. For Oxygen Cleaning add suffix, "-O2" to the model number; add $125 to price.